Lasers have been successfully used on humans for over 30 years. 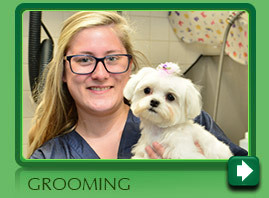 This human experience is now proving to be of benefit for use in pets too. A laser is a device that generates an intense beam of light at a specific wavelength. The most commonly used surgical laser is a carbon dioxide (CO2) laser that produces an invisible beam of light which vaporizes the water contained in the cells normally found in the skin and other soft tissues. This beam of light can be focused to remove only a thin layer of tissue offering superior control to the surgeon and leaving the surrounding area unaffected. The advantages of using laser surgery are three. First, laser energy seals the nerve endings as it moves through tissue. Thus, your pet feels considerably less pain post-operatively. Second, the laser seals small blood vessels (less bleeding) thereby greatly improving the surgeon's visibility and subsequent precision. Indirectly, this may decrease your pet's surgical and anesthetic time. Lastly, there is less swelling because laser energy does not crush, tear or bruise any tissues and seals lymphatic vessels. The laser sterilizes as it removes diseased tissue by killing bacteria. 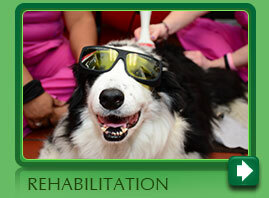 Overall, laser technology reduces the trauma to your pet, improves recovery and often shortens the hospital stay. While the declawing of a cat may be controversial in nature, it is probably the best example of how laser surgery can change one's attitude toward a procedure that is considered by some to be painful and therefore cruel to perform and make it acceptable. Recently, I performed two declaw procedures on young cats using my laser surgery unit. While I believe that surgery of any type must carry with it the consequence of some degree of discomfort, it is truly amazing how comfortable these cats appeared post-operatively. Within hours of their anesthetic wearing off they were purring, walking and even playing with my staff. If you decide to declaw your cat then I would strongly encourage you to consider laser as the preferred method of surgery. There are of course many other types of soft tissue surgery that can benefit from using the laser technology but none are quite so dramatic as the declaw in their post-operative recovery.